Yesterday, Google's Matt Cutts announced on Twitter that they have pushed out a refresh to the Google Page Layout algorithm on or around February 6th. He did not specify how much this impacted the search results but based on my analysis of the SEO community, it had a very small impact on most SEOs. This would be the third update to the page layout algorithm. Since it is just a refresh, it doesn't mean Google updated the algorithm, but rather reran the algorithm and updated it's index. So I doubt Google would classify it version 3.0, but rather 1.2 maybe. 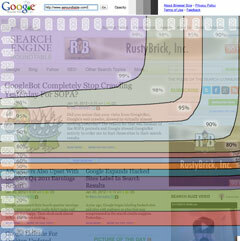 SEO folks: we recently launched a refresh of this algorithm: http://t.co/KKSXm8FqZW Visible to outside world on ~Feb. 6th. Again, very few seem to have been impacted by it but there are some and they are complaining in the forum threads I link to below. Forum discussion at WebmasterWorld, Google Webmaster Help, Black Hat World and Twitter. Previous story: Google Webmaster Tools Search Queries Impression Data Drop?